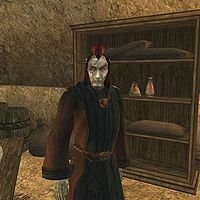 Bratheru Oran is a Dunmer nightblade who lives with Edryno Arethi in the southern corridor of the Hlaalu canton Waistworks in Vivec. He sells spells to anyone who needs them, whether or not you are a member of House Hlaalu. He wears a common robe, shirt, and shoes. He carries a steel spider blade along with 40 drakes. Aside from his natural resistance to fire and the sanctuary provided by his ancestors, he knows an assortment of spells from the schools of Alteration and Illusion. Specificially, these are the same spells that he has for sale.